Make your own snow cone syrup with just a few ingredients and enjoy a quick and easy treat on a hot summers day! Try this easy Homemade Snow Cone Syrup Recipe! It’s HOT outside! The kids are home, they want fun things to do all day long, and they want to eat. My kids eat all day long! I feed them breakfast, and 30 minutes later they want a snack. Then, it’s lunchtime, and snack again. Then, they have the nerve to ask me what’s for dinner?? Really? Didn’t they just eat? ~Sigh~ So, I fix them dinner and then of course dessert. Homemade Snow Cone Syrup for snow cones is perfect! 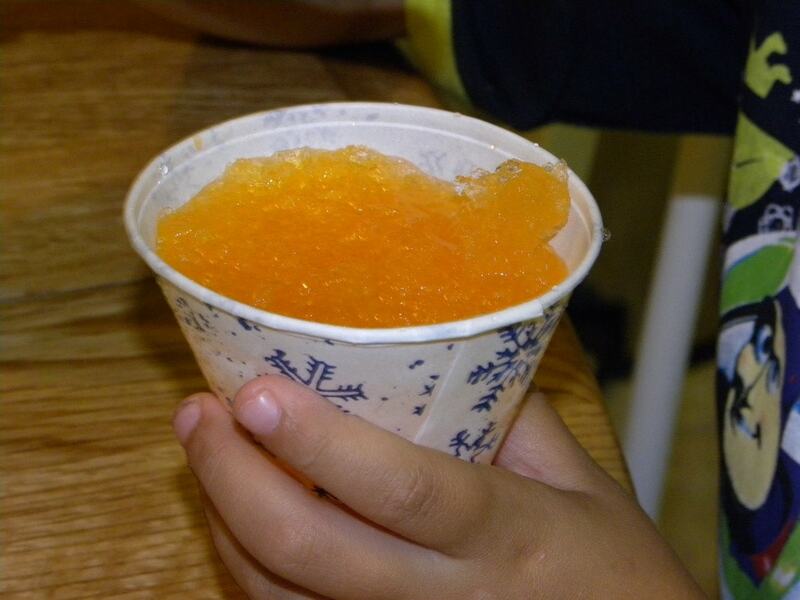 Next time your crew is wanting a Snack on a hot summers day why not make Snow Cones?? One of my readers, Angela, from McCalla, AL sent me this winner! I guess I just never thought about making my own Snow Cone Syrup. Angela sent me this email, and it won me over! What a great idea! You can make it in any number of flavors, and you could even lower the sugar in the syrup if you wanted. My kids want to try lemonade flavored next! Thanks, Angela for sharing such a great recipe, and now I am sharing it with you! Stir together kool aide, sugar, and water in a saucepan over medium heat. Bring to boil stirring constantly. Allow mixture to boil 1 minute. Place in empty squirt bottle, and pour over crushed ice! Place in the empty squirt bottle, and pour over crushed ice! Love it! I never thought of making my own snow cone syrup! It’s the perfect summer time treat! I have used Sonic (the fast food place) ice in place of shaved ice in the past and it works GREAT! AND they usually only charge $.99 per bag. Thanks for the recipe, I can’t wait to try this with the kids! I recently purchased a Ninja foodchopper/smoothie maker at BB&B using a 20% off coupon. I bought it with Snow cones in mind, and I love it. It works perfectly to get that nice snow-like texture. I tried all kinds of food processers but ice came out like tiny gravel. I thought I would post this in case others like an appliance with more than one purpose. Thanks for the syrup recipe!! Great idea! I’m going to try it with fruit juice and see if that will work. Ya think? I bet if you used 1 cup of Fruit Juice and 1 Cup of Sugar it would turn out great! You could probably even use less sugar!